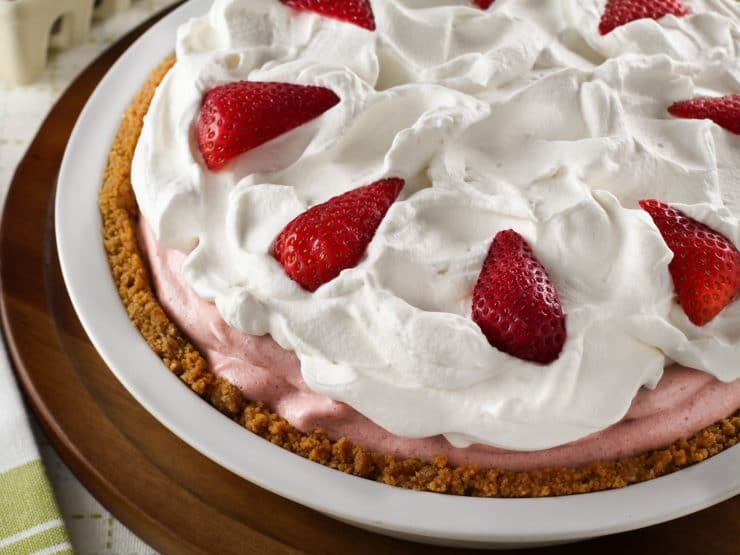 Strawberry Chiffon Pie – Light and Fluffy Strawberry Filling Inside of a Crisp Graham Cracker Crust and Topped with Whipped Cream. Time-Tested Family Recipe. A well made chiffon pie is a thing of beauty. 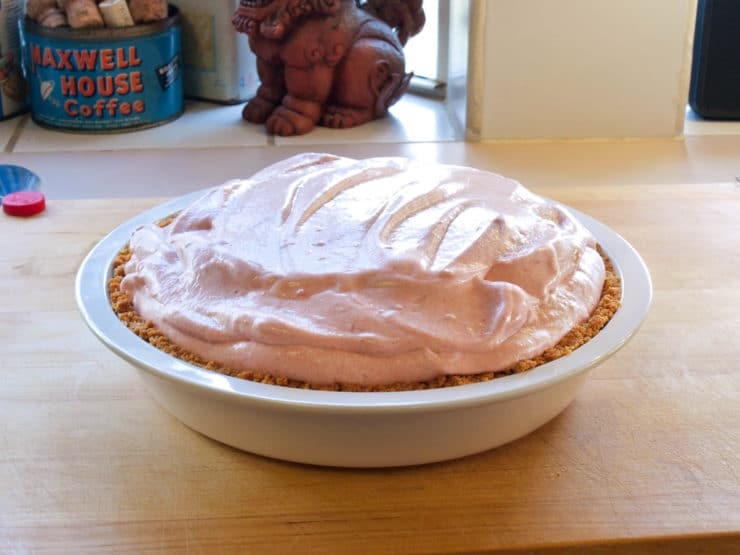 A chiffon pie, if you do not already know, is a pie that is made with a flavorful custard base that is lightened with egg whites and set with gelatin. 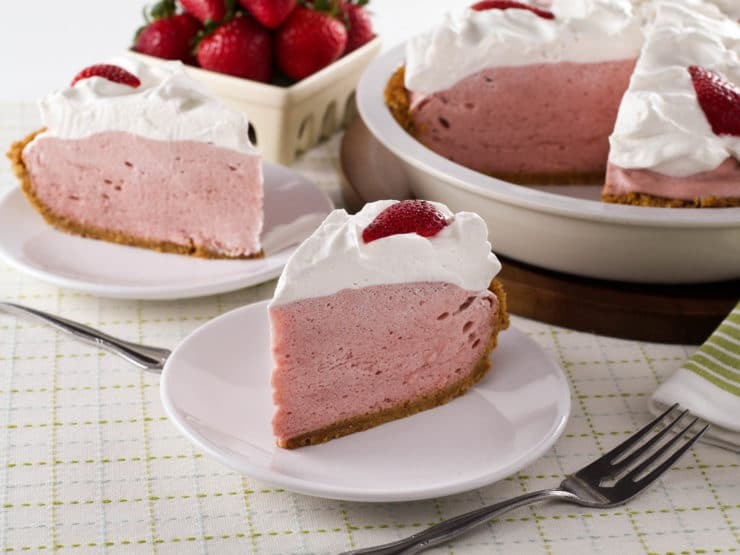 This style of pie was invented in 1926 by Monroe Boston Strause, otherwise known as ‘The Pie King’, who invented the chiffon pie to reinvigorate his families’ pie business, which was losing market share to the up and coming cake industry. It is said that his mother, upon sampling the pie, compared the delicate filling to a pile of chiffon, and thus the pie was named. My mother is the queen of the chiffon pie in our family. For Thanksgiving every year my mother makes her legendary lighter-than-air pumpkin spice chiffon pie, which is perfect after a huge dinner. When I was a child I looked forward to my mom’s chiffon pies. I loved the wiggly filling perched in its crispy crust, and I loved how it felt like a sweet, melting cloud in my mouth. My mother learned her chiffon pie technique from her mother, who made many mile high chiffon pies in her day. I do not remember my grandmother making chiffon pie, she always made me cream pies since I liked them so much and she was apt to spoil me. I always remember my mom making them, however. They were always ready the day before a party, shielded from my greedy hands by a plastic pie dome in the refrigerator. As I grew older my mom would let me help by whipping egg whites, or pressing cookie crumbs into the pan for the crust. It was not until a few years ago that I sat with her in the kitchen while she made a chiffon pie that I learned all of her secrets. Use the best base ingredients. For a fruit based pie you want ripe, sweet, and flavorful fruits since this will be the primary flavor of your pie. Don’t over-whip your egg whites otherwise your filling will be dry and grainy. Adding the sugar to the egg whites while they whip will help keep your egg whites moist. Chiffon pie is best in a crisp cookie crust. You need the contrast in texture to keep the pie from feeling mushy. Let a chiffon pie chill overnight before serving, and always serve it cold. Don’t hold a chiffon pie more than a day or two, however, or the crust will become soggy. A pinch of cream of tartar will help your egg whites to whip up light and fluffy. Don’t let the cooked custard base set before adding your egg whites, but don’t fold in the egg whites if the filling is too warm. Either way the egg whites will deflate and your pie will be dense. As you can see, they have a lot to say on the subject! What I love best about chiffon pies is the versatility. You can use just about any fruit that is ripe and in season for these pies, and they are good all year round. In the summer, when the heat is oppressive, nothing beats a cold slice of fruity chiffon pie. During the holidays when you stuff yourself silly, no dessert is better than a not-too-rich chiffon pie. I can eat them anytime, and they always remind me of my mom. While I make a mighty tasty chiffon pie, my mom’s is – and will always be- better. 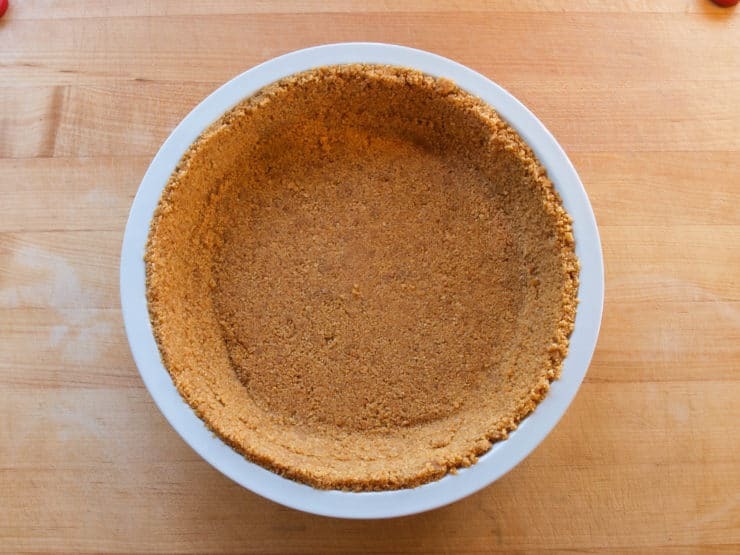 One final note about safety – This pie contains uncooked egg whites, so if you are planning to serve this pie to children, the elderly, or the immune compromised please use pasteurized eggs to avoid any risk of illness. It is always best to use very fresh eggs, pasteurized or not, for safety. Begin by making the crust. Heat the oven to 350°F. 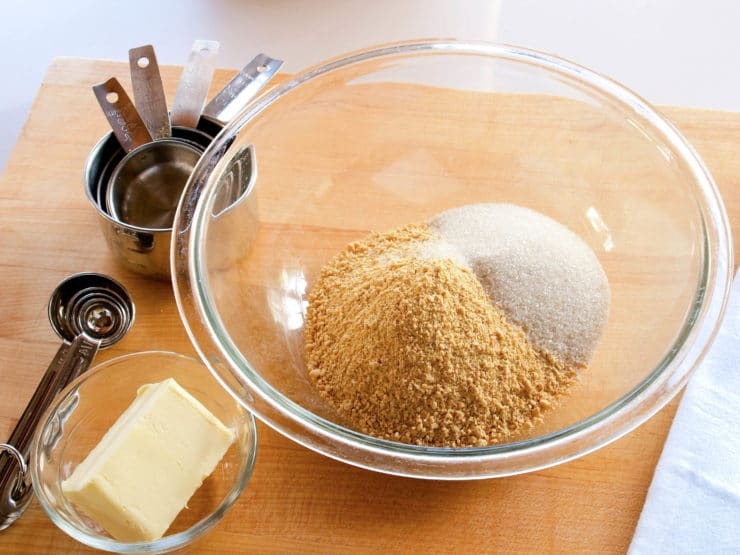 In a medium bowl combine the graham cracker crumbs, sugar, and melted butter. 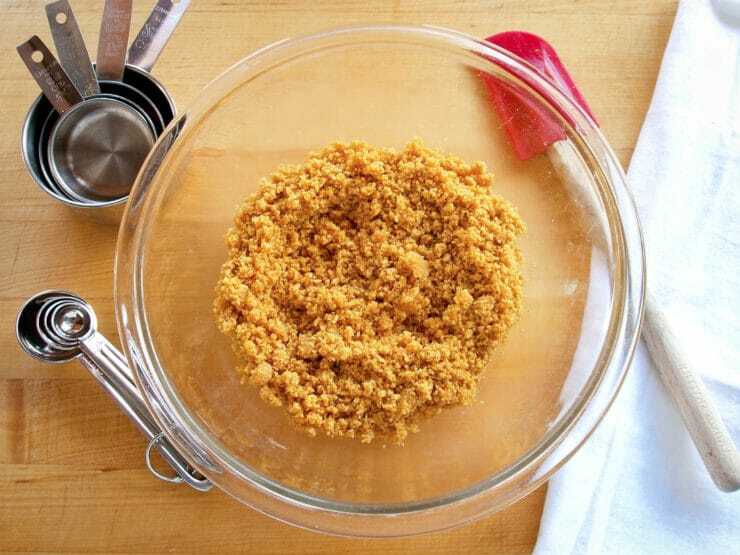 Mix until the graham cracker crumbs are evenly coated in butter. Press the crumbs firmly into a 9-inch pie pan. Bake the crust for 10-12 minutes, or until the crust is golden brown and firm when gently pressed in the center. Cool completely to room temperature before adding the filling. Next, prepare the filling. In a small bowl combine the water and powdered gelatin. Allow to stand until completely bloomed, about 10 minutes. Set aside. 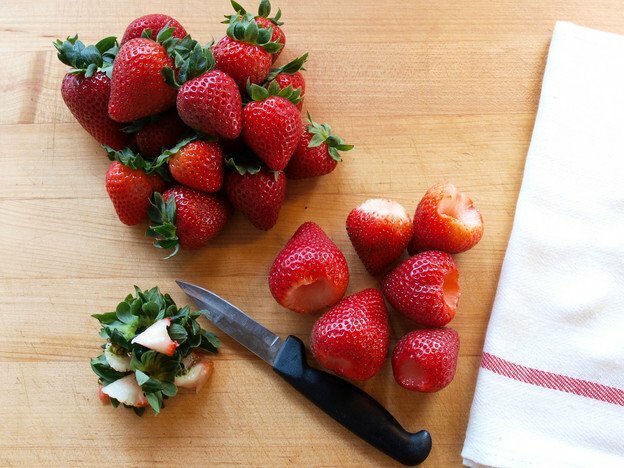 Place the strawberries in the work bowl of a blender or food processor. 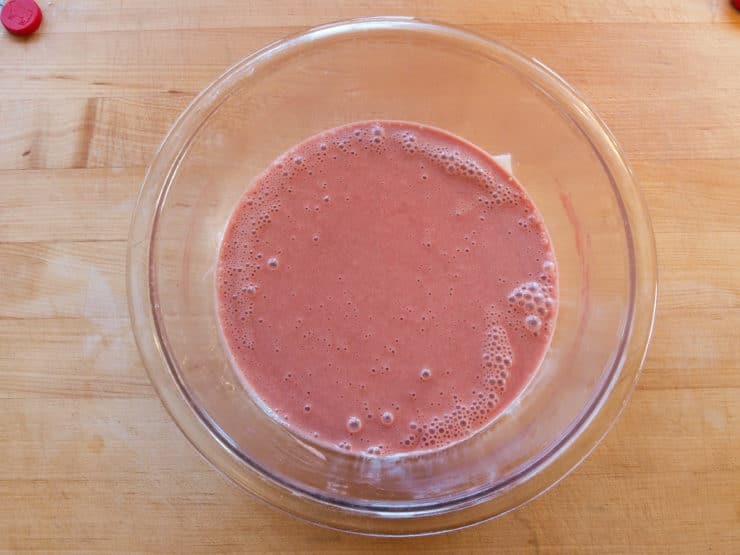 Blend on high speed until the strawberries are thoroughly pureed, about 1 minute. 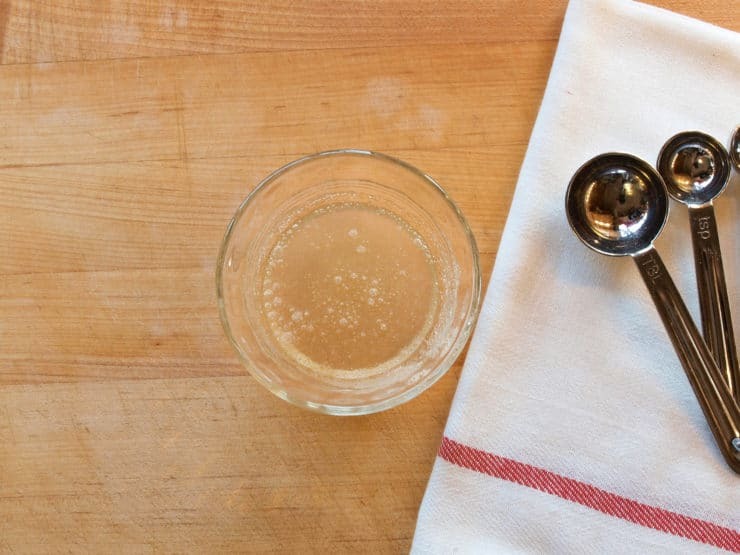 Pour the puree through a fine mesh strainer to remove any seeds. Measure out 1 ½ cups of the puree. 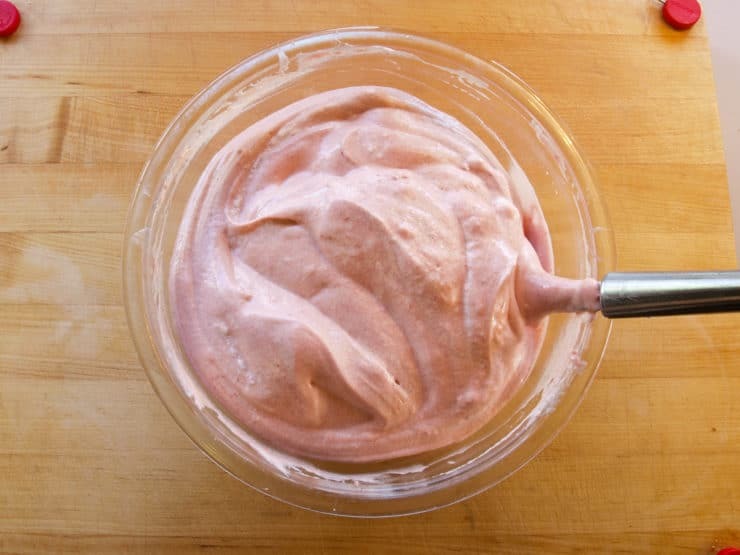 Reserve any additional puree for mixing into smoothies, or pouring over ice cream. 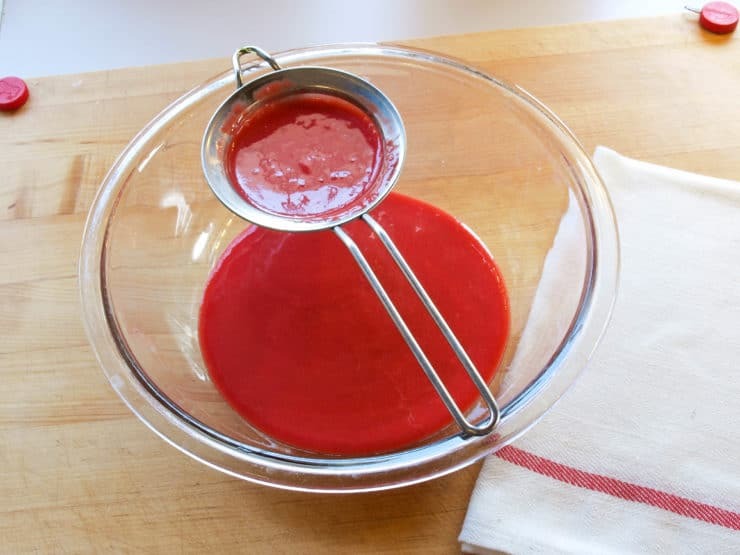 In a heat proof bowl, or the work bowl of a double boiler, combine the strawberry puree, egg yolks, ¼ cup of the sugar, and the vanilla. 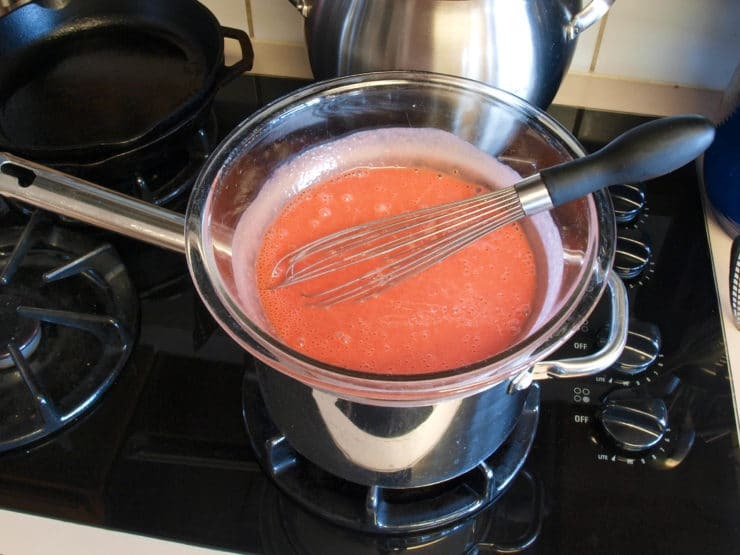 Whisk to combine then place over a pan of simmering water. Cook the mixture, whisking constantly, until it thickens enough to coat the back of a spoon thickly and reaches a temperature of 160°F, about 8-10 minutes. Remove the bowl from the heat and add the bloomed gelatin. Whisk until the gelatin is completely melted, about 1 minute. Chill in an ice bath for 3-5 minutes, stirring constantly, until it thickens slightly and is no warmer than room temperature. Set aside. In the work bowl of a stand mixer fitted with the whip attachment, or in a large bowl with a hand mixer, add the egg whites, kosher salt, and cream of tartar. Whip on medium speed until the white are frothy, about 1 minute. Increase the speed to medium high and gradually add the remaining ¼ cup of sugar. Continue to beat until the egg whites form medium peaks, about 1-2 minutes. 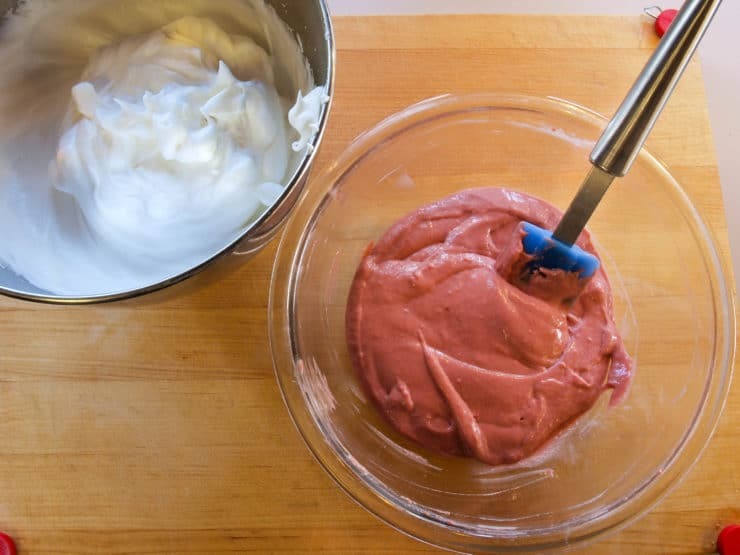 Working in thirds, fold the egg whites into the strawberry mixture, making sure no large streaks of egg white remains. Pour the mixture gently into the prepared crust and chill until firm, about 4 hours. Once chilled prepare the whipped cream topping. In the work bowl of a stand mixer, or in a large bowl with a hand mixer, add the cream, powdered sugar, and vanilla. Whip on medium speed until the cream begins to thicken, about 1 minute, then increase the speed to medium high until the cream is fluffy and holds medium to firm peaks, about 1-2 minutes more. 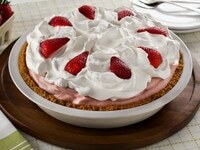 Spread the whipped cream over the pie, and decorate with slices of fresh strawberry if desired. I just made this. Will serve it tomorrow. I think it should be in a deep dish or a 10” pie plate. In the late 1950’s Sahr’s Fountain and Restaurant on SE Jefferson and 18th in Portland, Oregon, served mile-high chiffon pies. I remember strawberry and chocolate, but I believe they had several more flavors. You mention pumpkin chiffon in your introductory comments, and I want very much to try that. My mother made her own pumpkin ice cream pie that was so much better than just putting pumpkin ice cream into a pie shell. And she finally relinquished her recipe in her 80’s. Would you like to trade those pumpkin recipes with us? This is Kelly’s recipe, I will check with her! I think you could make this with whipped cream instead of egg whites. 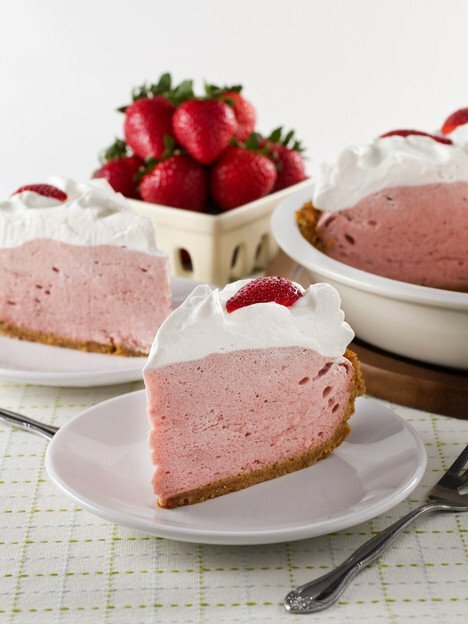 I would whip 2 cups of heavy cream with a little powdered sugar (2 or 3 tablespoons should be good) and 1/4 teaspoon of vanilla to soft peaks, then add the cooled strawberry mixture and whip it in until the mixture is firm – just a few seconds. Chill for 4 hours before serving. You may need to add a little additional gelatin to the cream to keep it light. Let me know if you try this! I would love to know hoe it turns out! Thank you! Yes I’m going to make it this weekend. Hey Tori, instead of using the egg white mixture can I use freshly made whipped cream? I know it wouldn’t be exactly the same but would it work? I haven’t eaten a chiffon pie in years and years. My mom used to make the most wonderful lemon chiffon pie. I think I must learn to make one. Have an easy fast. And, Shanah Tovah! I have done this with sugar free strawberry hello and SF cool whip. Way easier and quicker! wow, lovely Shana Tova to you all!!! Shabbat Shalom! The pie looks delish! Will definitely have to make this over the weekend!! That looks just luscious – a perfect way to use strawberries, one of my favorite summer fruits! Shabbat Shalom! My gosh, I remember my mother making this when I was a little girl; one of my favorites. Shabbot Shalom. This pie looks Delicious!